Whether you are a professional landlord or a first time investor just starting out PARSON will always give an honest approach and expert advice to ensure you avoid the pitfalls of letting and enjoy the rewards of successfully letting your property. We provide a professional service and swift accounting. We are here to make letting your property easier and as safe as possible. Legislation governing the rental market is constantly changing and we are here to advise, guide and help you understand the changes in the regulations and what they mean as a landlord...And there are penalties for not complying. PARSON are members of both the NAEA and ARLA part of the NFoPP, – THE National Association of Estate Agents and Association of Residential Letting Agents part of the National Federation of Property professionals. This is the only body which has self-regulation of letting agents ensuring high standards. Part of the regulation is mandatory client money protection and regular audited client accounting. You can be sure of the highest of standards with PARSON! Regulations require that from 1st October 2008 all landlords will have to provide a valid EPC for their property before it can be let. Failure to comply with the legislation could result in a fine and prevent a landlord from offering the property for rent. We advise organising your EPC as quickly as possible. This regulation applies to new tenancies only and does not apply to lease renewals by sitting tenants. 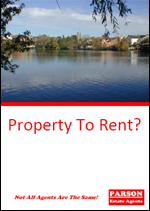 The EPC must be available to any prospective tenant at the point of viewing or enquiring about the property. PARSON are able to arrange your EPC for you. Please call or pop in and we would be delighted to help and advise you of the costs and options. An EPC assesses the energy performance of a property and will make recommendations on how to improve its energy efficiency. 'A' is the highest score that a home can receive and it means that the home has excellent energy efficiency. 'G' is the lowest score; the average score of a home in the UK is D.
The EPC will show a building's environmental impact by indicating its carbon dioxide emissions. It must be carried out by a qualified and accredited Domestic Energy Assessor (DEA) or Home Inspector. Energy Performance Assessors are likely to be in demand so we advise landlords to consider getting their properties up to standard and assessed as early as possible. An EPC is valid for 10 years and can be used for multiple tenancies within that period. It can be renewed earlier if the landlord wishes to reflect any improvements they have made to the property, however there are no legal requirements for an EPC to be renewed if landlords have upgraded their property in response to earlier recommendations.